“Time heals all wounds” is a saying that doesn’t really apply to gemstones, does it? Humans are finite; the average human lifespan is roughly 79 years, and it’s a bumpy ride from start to finish. Even the most coddled person on this planet will accumulate bruises and scratches through this game of Life. So in time, everything about us eventually wears away: our bodies, our minds, our hearts, so on and so forth. Memories are no different. Happy memories and sad memories are equally impermanent. We cling onto some more than others, but in the end, everything eventually slips out of our grasp. So when we suffer through tragedy and grief, Buddhism teaches us to let go. Let go of our attachments and we will also let go of the pain. After all, nothing is permanent, not even our memories. As they say, “Time heals all wounds.” But again, that doesn’t really apply to gemstones, does it? Even if gemstones are technically not immortal, they may as well be. And short of losing significant parts of their bodies like Phos, their memories stay perfectly intact. So when a gemstone undergoes a powerful, transformative experience, it is as if a memory has been etched into their crystalline body. The memory becomes them. No wonder you have to lose a part of yourself in order to lose your memories. For these gemstones, there is no “letting go.” They cannot simply free themselves from attachments. For the most part, their memories are not impermanent. Just look at how nonchalantly Paparadscha addresses Phos even though they hadn’t spoken in over 200 years: “You’re the little pebble always hiding out behind Sensei, aren’t you?” But just as one cannot forget happy memories, one cannot forget painful ones either. The sadness of losing a loved one is just as fresh today as it was 200 or 300 years ago. What can you do when the pain never ends? As we’ve already learned, Rutile has and will continue to slave away at the Sisyphean task of repairing Paparadscha’s damaged body. The good doctor has operated on it a total of 300,030 times. If they give up now, they’d have to regard themselves as a failure. And if they can’t succeed as a doctor, then what would they do? Become a warrior like Bort? Alex is a Lunarian fanatic, because they once lost someone dear to them: “That’s why I spend every day thinking about the Lunarians. So that I never forget that fresh feeling of hatred I have for them.” But Alex can’t forget. In truth, the gemstone studies Lunarians, because this allows them to channel their grief into something productive. It is the same with Rutile. If they each didn’t have their obsessive quirks, then what would they do with their hatred instead? Everyone deals with grief in their own way. What is certain, however, is that the grief never really goes away. And as such, we must replace that grief with an obsession, an unending quest to distract the heart. So that brings us to Kongo and the truth. The older gemstones have enough pain and sorrow to deal with even if their cheery nature belies the truth. As such, they are busy enough with their own set of tasks and responsibilities — activities designed to distract them. So what good would the truth do them? What if the truth irreparably tears down their very understanding of their existence and the world around them? 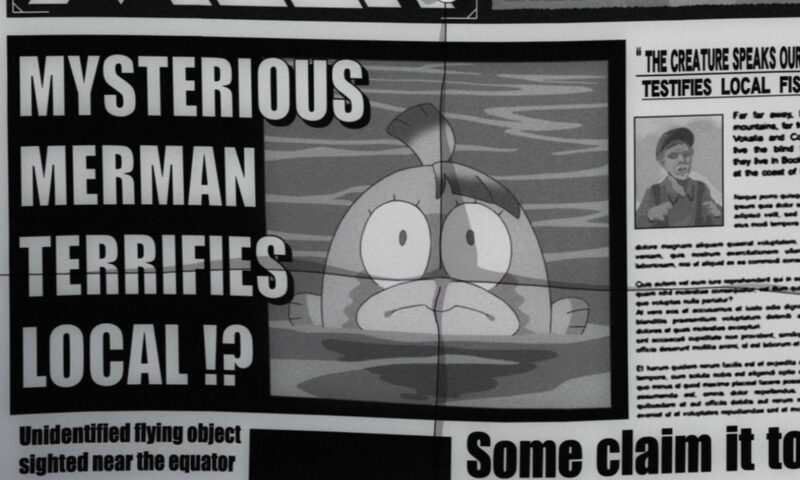 We’ve already seen what losing a loved one can do to a gemstone. Imagine them suffering from an existential crisis. Now imagine having to deal with the aftermath of that for an eternity. As such, it makes sense why everyone has made “an unspoken agreement to trust in [Kongo].” They opt instead to fulfill the roles that they’ve been assigned. One gemstone sews clothes, another one sharpens blades. One’s a doctor, another runs the morning meetings. These are tasks that seemingly never end. These are tasks that seem to extend to perpetuity. The threat of the Lunarians also never ceases. It’s almost as if everyone — Lunarians included — are trapped in a prison of their own making. Phos has forgotten their original promise. This quest to uncover the truth is really for their sake, not Cinnabar’s. Cinnabar having a role to play at all seems almost incidental. After all, the only other gemstone who might share Phos’s distrust of Kongo is the crimson gemstone. 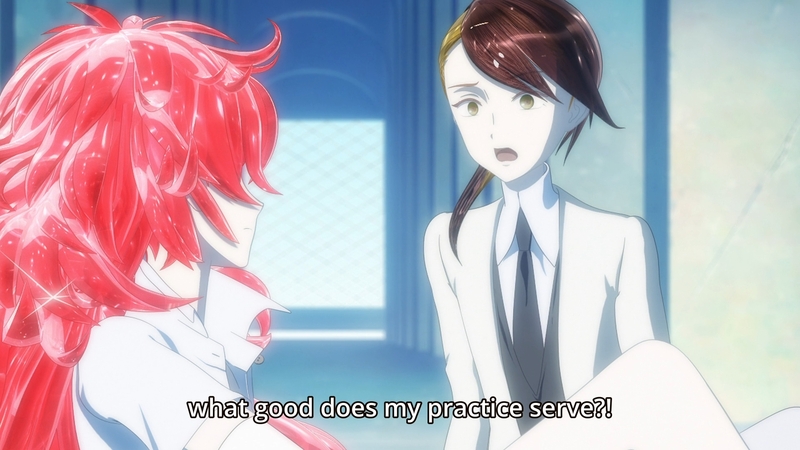 What’s notable, however, is that Cinnabar can be seen blushing as they recall Phos’ words (who knew gemstones could blush). The simple truth is that the tortured gemstone is only seeking genuine company and friendship, but that’s not something Phos can provide right now. As such, Cinnabar resignedly adds, “If you just wanted to team up, well then…” Just seconds before this, we can hear their thoughts: “I want to be free of the night. But I can’t… I feel nothing but distrust. 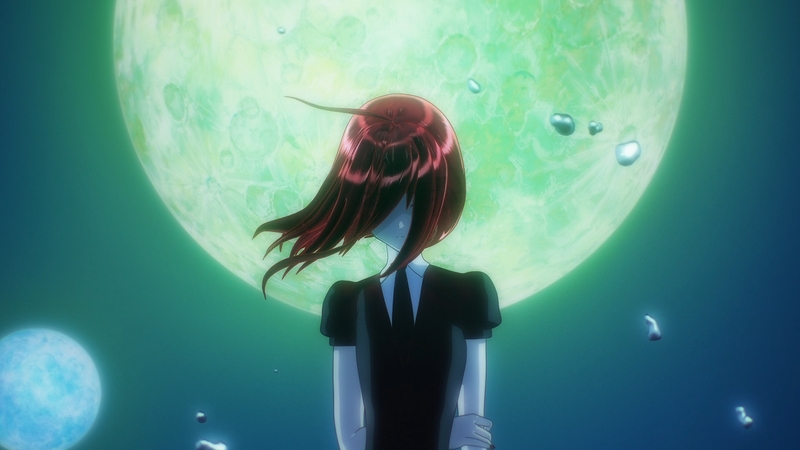 But…” Even after all this time, Phos has given Cinnabar little reason for the latter to entrust their feelings to the former, but they’ve got no other choice. Everyone else has forgotten about them. Even if Phos isn’t offering much a solution, it’s the only one on the table. Perhaps Phos is really no different from the other gemstones, but their obsession is subtle. Understanding the Lunarians and uncovering the truth would be no different from filling out an encyclopedia with knowledge. Phos is not putting their experiences to paper, but in essence, Phos is fulfilling their original assigned task without even realizing it. Everyone deals with grief in their own way, and this is Phos’s. To quell the nightmares that visit them every time they close their eyes, Phos will try and communicate with the Lunarians. But what would young Phos have done instead? Like they said, they used to follow their hunches. And even from a young age, Kongo recognized their kind heart. Young Phos probably would’ve followed their gut and abandoned the search for the truth. They would’ve instead continued on their quest to find something better for Cinnabar. But ironically, this sort of thinking is what got Young Phos into a whole bunch of trouble in the first place. And that trouble eventually led to their transformation and now current obsession. 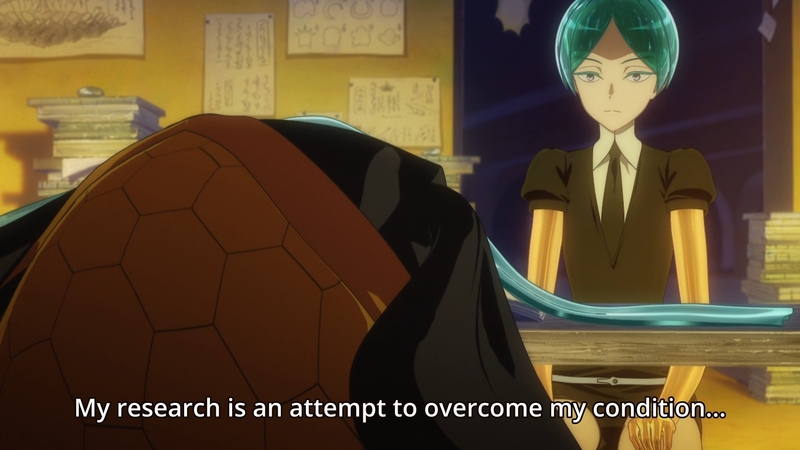 Maybe any attempt to help Cinnabar can only lead Phos further away from the original goal. If that’s true, then it’s a cruel twist of fate. Houseki no Kuni has its flaws, but overall, it’s an interesting, thought-provoking show. If they do a sequel and I’m still around, then sure, I’ll keep following the series. First of all, thank you for your coverage of Houseki no Kuni! This series quickly became one of my all-time favourite and your episodic analysis of the show was always thought-provoking and managed to touch upon various themes. The questions of personhood and self-improvement were integral to the series’ premise and were elaborated carefully in these weekly posts. However during it’s run you mentioned other interesting topics, like the Bort-Dia duality of logic and emotion, or this episode’s theme of grief and obsession; topics that I initially didn’t even think of while watching the show but proved to be interesting to ponder on later. 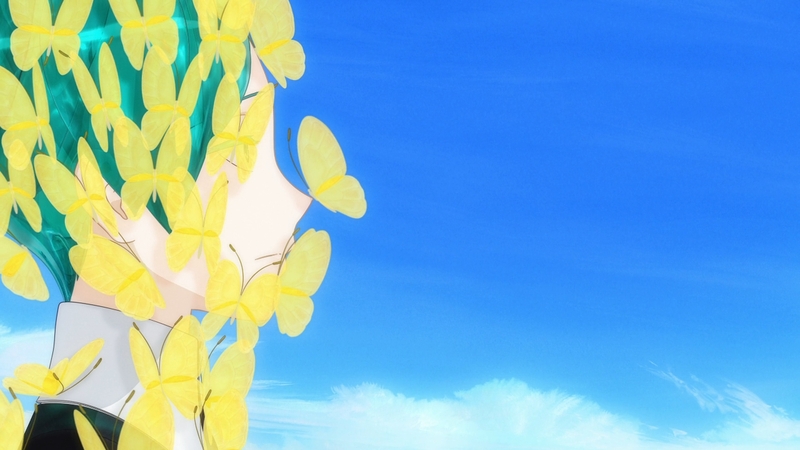 My final verdict would be an A, or A- for the show, since for me the potential flaws were dwarfed by the other aspects, like the superb visual and sound directing, the spectacular cinematography of the battle scenes, or the delicacies of Phos’ character. Here’s hoping for a second season! That part that compares the young Phos with the new one breaks my heart. The current Phos has lost her innocence and seems less cheerful, and more intellectual. It’s a tradeoff, and I hope she can still find it in herself to give Cinnabar the companionship she needs, which she could have more easily given at the beginning of the series. The continuation and the twist sounds promising. Previous PostPrevious Inuyashiki Ep. 11: Baby, you’re a firework!